Battle ropes are the latest fitness tool that has gained amazing popularity with fitness enthusiasts, bodybuilders, athletes and sports persons. Forget jogging, weight training and Pilates, battle rope exercises are all you need to burn calories, lose weight and tone your muscles. It is a highly versatile instrument that can be included in your fitness regime in any way you want. 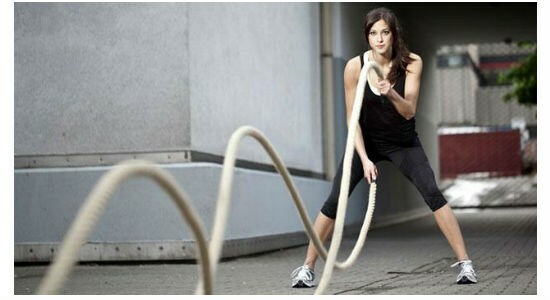 Battle ropes come in a wide variety of lengths and diameters which determines the overall weight of the rope. It is best to start with a lighter rope and then gradually move to heavier ropes. This particular workout using battle ropes may appear simple, but it is a great exercise to tone and strengthen the arms and the core. Start in a standing positing with overhand grip of the free ends of the battle ropes in two hands. Now, lower your body slightly to a squat position while maintaining an upright chest. Transfer your body weight to your heels. Now move your arms up and down alternately to create consistent alternating waves with the ropes. Keep changing the size of the waves. Smaller waves promote fat-twitching and speed of arm muscles, whereas bigger waves improve overall power. This is yet another basic battle ropes workout that promotes full-body power and enhances control. Start in a standing positing with overhand grip of the free ends of the battle ropes in two hands. Now, lower your body slightly to a squat position while maintaining an upright chest. Transfer your body weight to your heels. Now, move your arms together to create consistent waves with both the ropes. Here also you can create smaller and bigger waves alternately to develop speed and promote fast twitching of muscles. This is is a total body workout using battle ropes that involves quite a lot of movement. It helps in increasing flexibility and strength while toning the entire body. Hold the free ends of the battle ropes in each hand. Now, lift both hands overhead as you turn right and lunge forward with your right foot. Slam the ropes down on the floor in front go your right leg as you are lunging down. Return to the starting position immediately and repeat the same of the left side, lunging forward with your left leg. Repeat 10 lunges on each side. 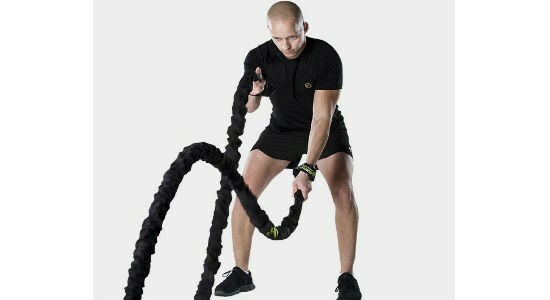 This is one of the intense battle rope exercises that targets the shoulders and helps in improving shoulder strength. Stand upright with your feet placed a little wider than shoulder-width apart while holding the ropes by your sides. Now, come to a squat position and keep your arms parallel to the floor. Move your arms in towards one another and then back out without crossing hands in order to moves the ropes on the ground just like two snakes. Try to continue it for 1 minute without taking breaks. This is an amazing and relatively easy battle rope exercise that tones the core and builds power and strength. Stand straight with your legs placed hip-width apart holding the battle ropes in your hands with overhand grip. Now, life up your arms and move the ends of the battle ropes overyour head in the form of and arc and bring them down to your left slamming then sown hard on the floor. Repeat the same in the opposite directing. Continue this alternating movement for 1 to 2 minutes. This is one of the most rope exercises that targets the legs, hips and the core. Begin in a standing stance while holding the ends of the ropes with an underhand grip. Now, come to a half-squat position, move the ropes towards your right hip and rip it across your torso over to your left with full force. Turn right as you rotate the rope over to your left hip and turn your right foot and knee inward. Land the ropes forcefully on the floor and immediately move the ropes across your torso back to your right hip, this time turning your left foot and knee inwards. Continue this rotating movement for 1 to 2 minutes. This one of the best battle ropes exercises that help to get a flat abdomen. It targets and works the entire abdomen – rectus abdominis, internal obliques, and the external obliques. Sit on the ground with your knees and feet placed in front. Engage your abs by leaning back slightly. Now, hold the battle ropes in front of your chest with both hands and rotate your arms and upper body to the right to slam the ropes into the ground. Then rotate to the left side and again slam the ropes into the ground. Continue this rotating movement at a rapid pace for 1 minute. 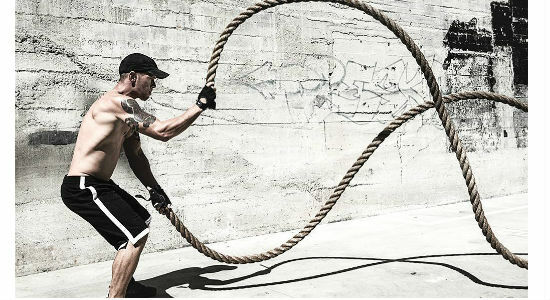 This an amazing cardio workout using battle ropes that helps to get the heart rate up and prepares you for the final stage of explosive battle rope workouts. Stand straight with overhand grip of the ropes. Now, jump and put your right leg behind your and push your left leg forward and at the same time move your right arm up and drop the left arm by the side of your left leg. Jump and switch your legs in the air and simultaneously lift your left arm up and bring your right arm down by the side of your right leg. Begin slowly in order to gain control over the entire move and gradually increase the speed. This is a relatively complex move that needs some practice, but it helps to strengthen the core and arms in no time. Start in a plank position with the battle rope in one hand and the other hand placed on the floor. Maintain a neutral spine and start moving the battle rope to form consistent waves with it. Repeat the same with your opposite arm. Don’t let your hips tilt to the side. 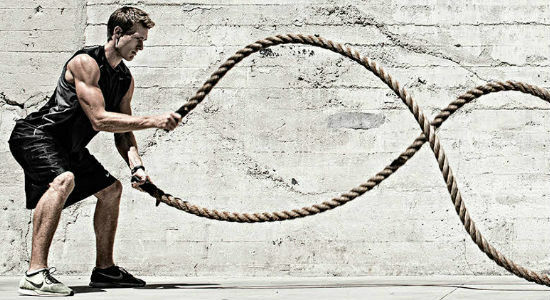 This is an explosive cardio exercise in itself and the inclusion of battle ropes makes it even more deadly. Hold the ropes in both hands and come to a slight squat position. Now, jump up explosively by kicking your legs out and swinging your arms and the ropes over your head and land in a squat position. Continue to repeat the jumps for 1 to 2 minutes. This is a functional and interesting variation of the classic battle rope slams that engages the arms and core in a more effective manner and works and a powerful calorie burner. 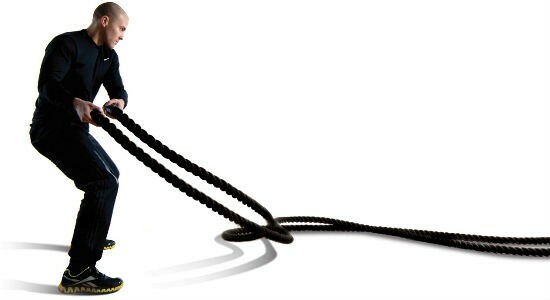 Hold one battle rope in each and stand with your feet placed shoulder-width apart and keens bent. Now, bring your hands together and move the ropes in a controlled manner to form a figure-8 pattern. Repeat this movement from right to left and then from left to right alternately, slamming the ropes on the ground in between sides. Continue for 1 minute without any break. 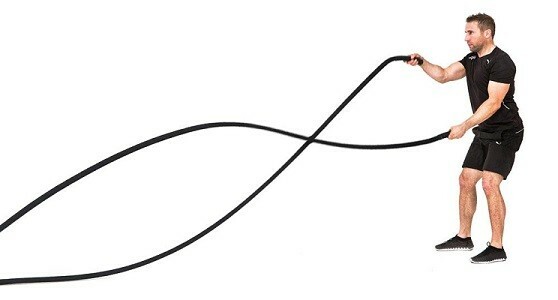 Feel the burn in the muscles and notch up your heart rate with this full-body cardio battle rope exercise that helps to promote weight loss from the entire body. Hold the battle ropes in each hand and stand with your feet placed shoulder-width apart and knees bent slightly. Now, move towards the anchor by hopping forward and simultaneously slamming the ropes on the ground in front of you with each hop. Do 3 to4 forward hops and then return back to the starting position by taking quick small steps and creating small waves with the ropes. 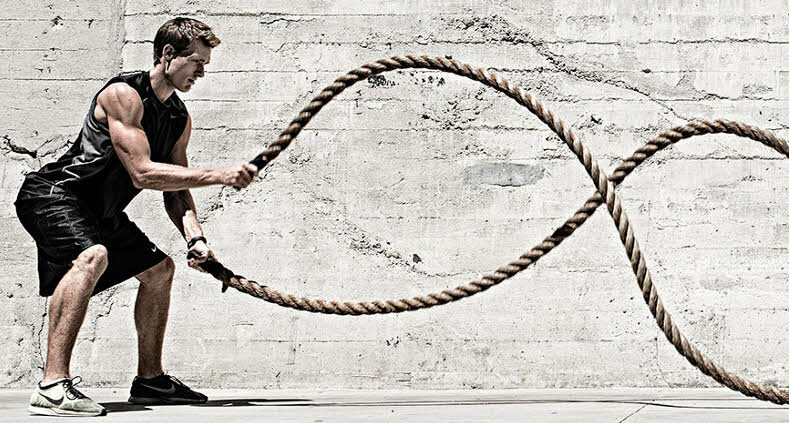 This is a complete battle rope workout that includes the benefits of waves and slams. It helps in shaping of the shoulders and arms while bring fat from the arms. 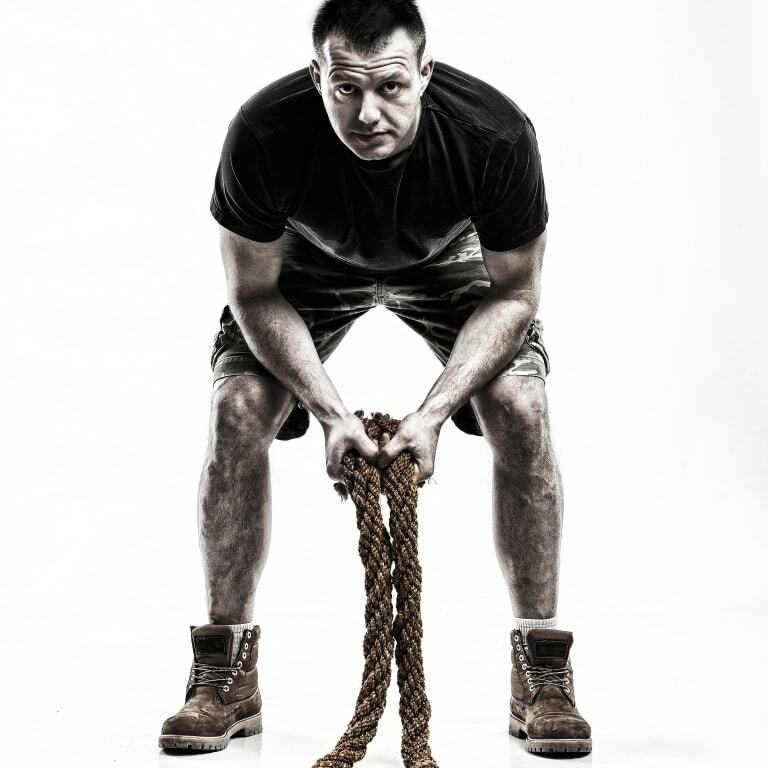 Hold a battle rope in each hand and stand with your feet placed shoulder-width apart and knees slightly bent. Now, lift the right hand up and lower the left hand to from alternating waves, continue alternating waves for 5 seconds and then lift both the ropes overhead as you jump up and slam them down on the ground as land in a squat. Repeat both the movements 5 times at a stretch. This is a compound movement that engages and stimulates a number of muscles and helps in fast weight loss. Hold the battle ropes in each hand and bend down slightly. Now, start moving your arms to create alternating waves with the ropes and at the same time shuffle to your right side by taking small and quick steps. Take 10 steps to the right and then change direction and shuffle to the left without stopping your arm movement. Repeat 4 times in each direction. Burpees are one of the most hated exercises in the gym, but it is killer workout for fast weight loss. Add battle ropes to it and you have a deadly combo. Hold the battle ropes in each and stand with your feet placed slightly apart. Now, start moving your arms up and down to create alternate waves with the battle ropes and continue to so it for 10 seconds. Then, stop the waves and immediately drop down to perform a burpee and then come up and repeat the alternating waves for another 10 seconds. Place two folded towels on the floor to protect your hands when you perform the burpee. Try to perform 3 to 5 burpees. Start using the battle ropes in your gym and install one in your backyard and make the most of this simple yet efficient training tool that works all muscle groups at the same time to improve strength and promote weight loss. Bipasha Mukherjee is a full-time content writer with a penchant for writing on health and fitness topics. Her passion is to help people towards a healthier life with her healthy food recipes and diet tips.